Asus launched the most awaited device Zenfone 5Z in India on 4th July and one more competitor joined the list of the flagship device. But the Asus Zenfone 5Z is different from other flagships as Asus have revolutionized the concept of smartphone to an intelligent phone with the help of Artificial Intelligence. The Taiwanese company has completely redefined the flagship with the Zenfone 5Z by bringing in a great combination of hardware and software. Let’s check out whether Asus Zenfone 5Z really takes over other flagships like OnePlus 6 and heats up the Flagship competition. Looking at the Zenfone 5Z, it completely looks gorgeous due to its Aluminium Body and along with the 2.5 D glass present at both the sides (front & back) of the phone, it feels great to hold. The Asus Zenfone 5Z comes with the 19:9 aspect ratio along with 6.2″ of the screen size. It has Full HD+ screen resolution and with 550 nits brightness, it always provides the best viewing experience even in bright sunlight. The Zenfone 5Z comes with 90% screen to body ratio. So, Zenfone 5Z provides you a great build quality along with a full-screen display experience that’s what you expect from a flagship device. 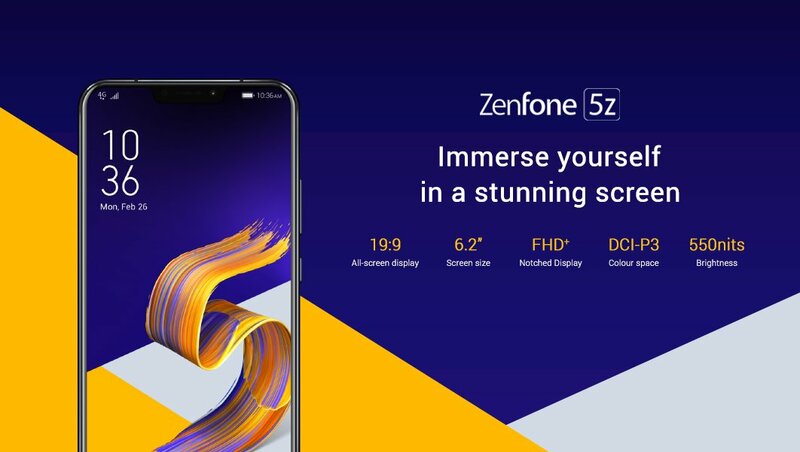 Asus Zenfone 5Z comes with the fastest and most intelligent processor – Snapdragon 845 the flagship chipset which is found in many of the flagships devices. The Adreno 630 GPU provides you an immersive gaming experience and along with the AI engine, SD845 makes the device smarter, faster & safer. 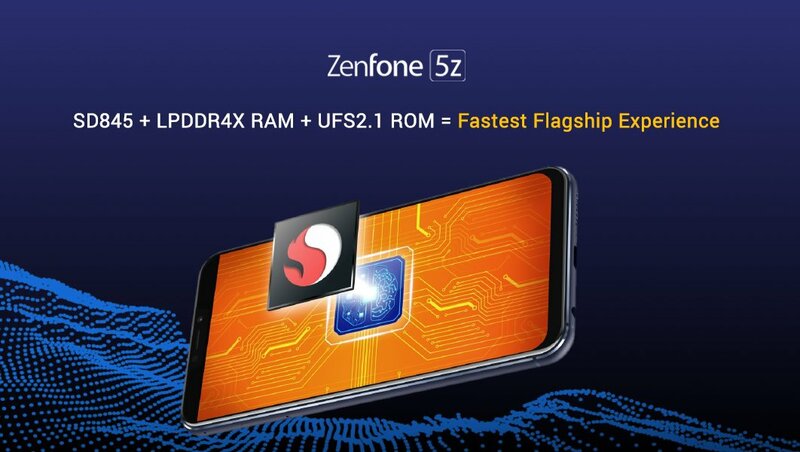 The combination of SD845 + latest DDR4X RAM + UFS 2.1 ROM technology provides you faster experience with the Asus Zenfone 5Z. Additional features like Dual 4G VoLTE and NFC Support are also bundled which is essential for modern smartphones. Asus also compared the boot time of 5Z with the OnePlus 6 and it resulted that the Zenfone 5Z boots up 3 secs faster than the OnePlus 6. So, they have targeted OnePlus 6 to provide their customers with much better experience than it. Asus have redefined the flagship device experience in every sector and so on camera. The Asus Zenfone 5Z comes with AI camera that thinks for its user. It provides you with great photos at day and even better at night all because of its IMX 363 Sony sensor that provides extreme low light performance. The camera has features like OIS, EIS and a unique feature RGB color correction sensor which provides you more accurate colors in your photos and this feature is missing in many flagships. So, Zenfone 5Z again brings in great camera features which click awesome photos. The secondary camera is a wide angle camera and also used for clicking those bokeh shots. The smart thing about Zenfone 5Z camera is that it comes with AI scene detection which detects the scene you shoot and switches accordingly which again helps you to click great photos at every possible situation. The AI camera can detect up to 16 scenes & the pro mode in it provides you an amazing photography experience along with features like DSLR cameras. The front camera comes with an 8MP resolution, f/2.0 aperture and one of the highlight feature EIS which helps to capture steady videos and an important factor for many of the vloggers. 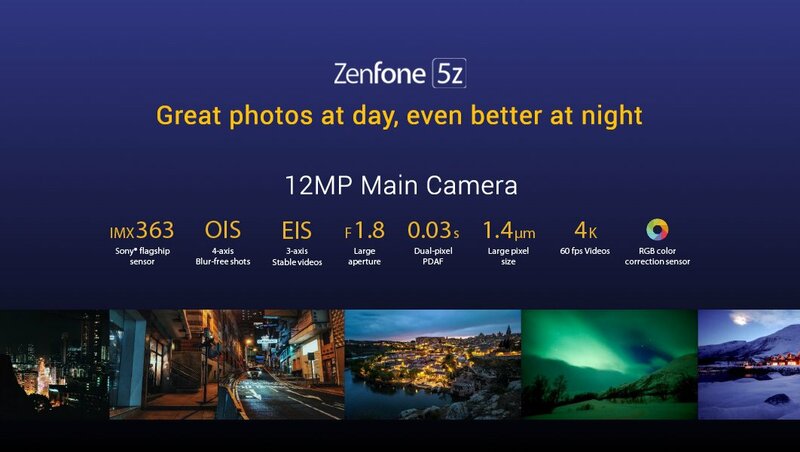 The Zenfone 5Z camera looks good and performs better all thanks to AI engine that provides all these features. Zen UI 5 that has an additional feature called optiflex technology that opens apps faster and with its AI features it understands the apps requirements of users and optimize itself to provide better UI experience to its users. Asus Zenfone 5Z supports fast charging and comes up with an AI feature that ensures 2X battery life. It charges up to 60% in 38 mins and it provides much better battery performance as compared to the OnePlus 6 and Samsung Galaxy S9. It gives you a great audio experience and has 3 noise-canceling microphones for crystal clear sounds. It has the 3.5mm headphone jack and Asus have provided Hi-Res headset for true audio experience for the same. In terms of security, the Zenfone 5Z has both face unlock and fingerprint sensor. It comes up with a fast face unlock and the fingerprint sensor takes up to 0.3s to unlock. 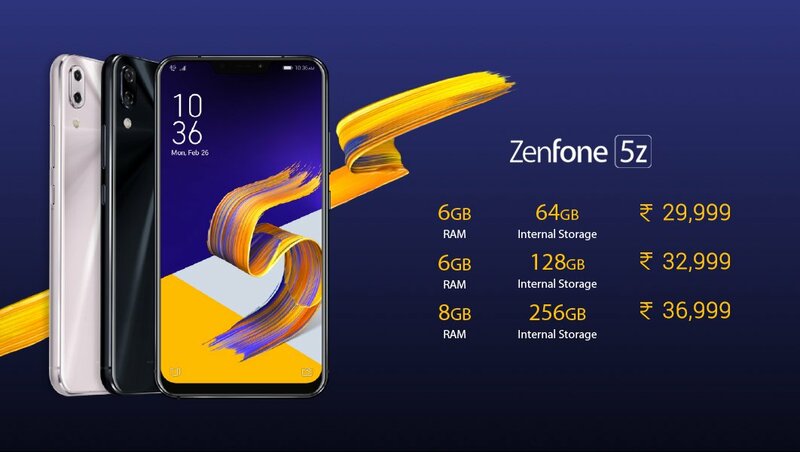 The Asus Zenfone 5Z will be available in 3 variants – 6GB RAM|64GB Storage, 6GB RAM|128GB Storage and 8GB RAM|256GB Storage. Also, it will come up in 2 color options – Meteor silver & Midnight Blue. 6GB RAM|64GB Storage – ₹ 29,999 ($440). 6GB RAM|128GB Storage – ₹ 32,999 ($480). 8GB RAM|256GB Storage – ₹ 36,999 ($540). Asus Zenfone 5Z will be available exclusively through Flipkart in India and the sale will start from 9th July. The Zenfone 5Z is now a tough competitor in the flagship devices race and from the price segment point of view, Zenfone 5Z looks great. It will take on the OnePlus 6 to be the best budget smartphone and looking at its features, it seems to take up that title.